Timing is critical for controlling weeds that infest and invade our pastures. 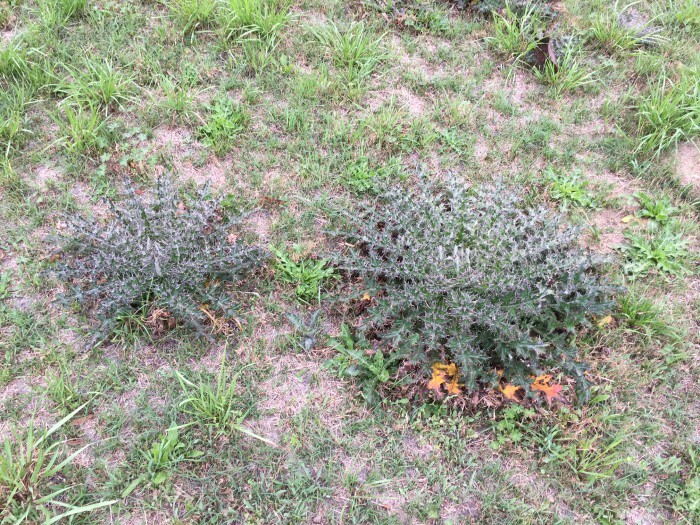 Thistles are an example of a weed in which proper timing of herbicide application can mean the difference between excellent and very poor control of the weed problem. Thistles are biennial, so in year one they come up from seed and form a small rosette, and in year two, they bolt and flower. The thistles in the photo above are still in the rosette stage of development; at this stage they are very easy to control with inexpensive herbicides. A timely application of one of several herbicides in year one, or even early in year two at the beginning of the bolting stage will provide economical control of this weed. 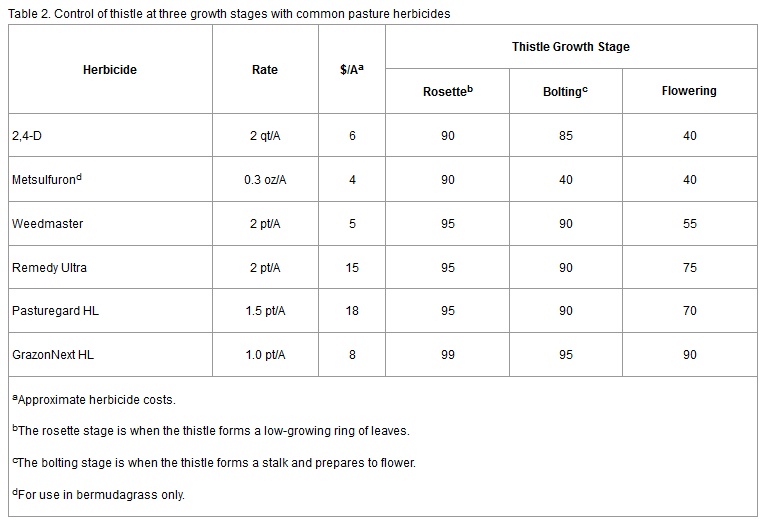 However, if you delay treatment until the plant is flowering, control is reduced and more expensive. Often it is the ugly flowers that draw attention to the seriousness of the weed infestation, but scouting for this weed in late winter and early spring can make a huge difference as illustrated in the table below. It is important to understand that a weed like thistle is very prolific. A single thistle plant can produce 4,000+ seeds. You can rapidly go from a situation where you only have a few plants to a very high populations in one or two years. The good news is that the herbicides available to control thistle will also control many of the winter annual weeds that are out there right now in Panhandle pastures and hayfields. Control measures include 2,4-D, Weedmaster (2,4-D+dicamba) or their generic alternatives, GrazonNext, Pasturegard, Remedy Ultra, or metsulfuron. One thing to remember is that these herbicides will injure clovers. Some, such as Grazonnext and metsulfuron, have residual activity that may affect clovers that are over-seeded later. Check the label for more information or consult with your local UF/IFAS Extension Agent. Shep Eubanks is the County Extension Director and Agriculture Agent in Gadsden County.